OMG! just check my post box! n saw the 2 thing that made me jumped! I finally receive my Clarin's member letter to go redeem my Clarin's voucher (from points collection) and a postcard from Clarins giving 2 special treats for their members! I already registered for mine yesterday. I picked The Move Your Body Workshop & Toxins in your Skin talk. As a loyal Clarins member; you are given the priviledged to enjoy exciting activities specially lined up for you besides the many attractive rewarding redemptions and rebates. Don't miss out on the oppurtunity. For details please contact your registered Clarins Skin Spa today. *terms and conditions apply. Limited seats only. Kindly register your preferred choice of activites by 12 February 2010. Please note that you are only allowed to attend events at your registered outlet. Maximun 2 preferred activites per member. - move your body workshop (26/6/10 - royal bintang damansara hotel or 19/6/10 - the spring, kuching. 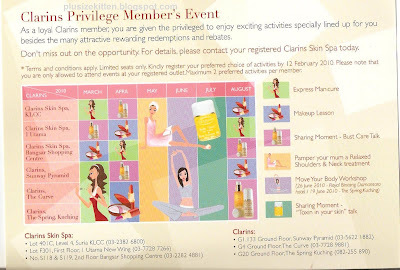 March 2010-August 2010 (different Clarins Skin Spa outlets, different sessions) pls check the time slots. which membership are u attached to? clarin very weird..they got different type of shop with different membership.